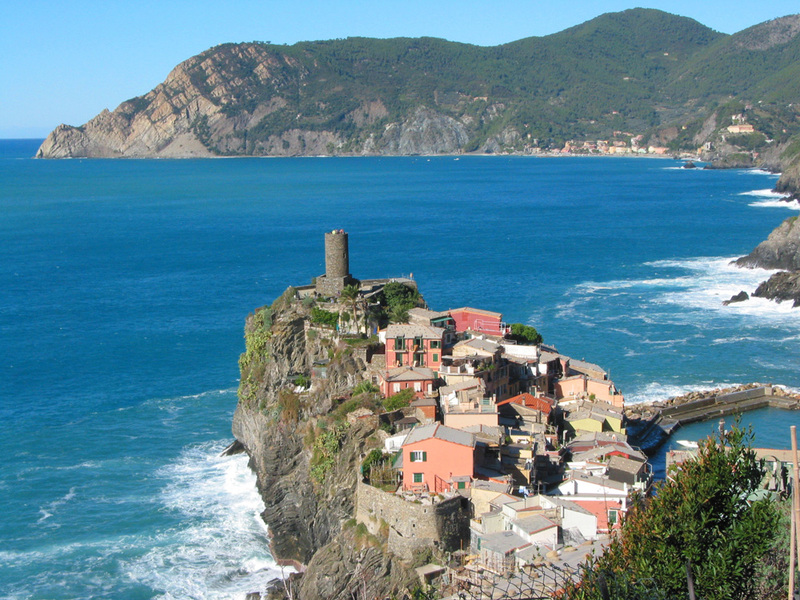 Hiking the Cinque Terre, it's impossible not to be bug-eyed at its spectacular beauty: rocky cliffs towering over aquamarine waters, quaint fishing villages painted a patchwork of pastels. That’s why I always remind my fellow trekkers not just to look, but to smell. “Remember these scents,” I say, “because we’ll be tasting them tonight in our wine.” Kicking along the rocky path, we inhale the perfumes of the macchia—broom and jasmine, wild fennel, pungent sage, resiny pine and juniper—along with flinty trail dust and salt air. Hours later, it’s all there, swirling around in our glass of Vermentino: a touch of savory herb, some delicate floral notes, fantastic minerality, and a trace of sapiditá—that salinity on the finish that identifies this wine as a seaside treasure. Vermentino is a grape that needs to see the sea. Plump and prone to breakage and rot, it craves the Mediterranean heat and radiant rocks and diurnal breeze off the water, like a bronzed Italian on permanent vacation in the Riviera. Vermentino thrives in Liguria, both east of Genoa (the Levante) and west (Ponente), where its genetically identical, freckled cousin Pigato also grows. (Pigato is dialect for spots, which develop upon ripening.) It also excels over the border in Provence and the Languedoc, where it’s called Rolle; in Provence, it’s the only grape permitted to be bottled pure, rather than blended. Traveling south along the Italian coast, it’s made a comfortable seaside home in Tuscany. But its cradle is Sardinia and Corsica, smack in the middle of this maritime triangle. One thing is sure. “The origin of Vermentino is a Malvasia from Iberia,” says Gagliano. “From a genetic point of view, Malvasia is a big grandmother of many Italian varietals,” and Vermentino’s cousins include Vernaccia di San Gimignano and Torbato from Sardinia. Complicating everything is genetic testing that suggests Vermentino’s kinship with Furmint, the grape in Hungary’s dessert wine, Tokaji. But all could have descended from some Ur-grape in Greece or further east, so the historical threads have yet to be untangled. While scientists battle it out, you can skip over to your local wine shop for some personal research. The Vermentino you’re most likely to encounter comes from Sardinia, which makes about 75 percent of Italy’s output. Two ubiquitous brands are Costamolino from ARGIOLAS ($15) and La Cala Vermentino from SELLA & MOSCA ($10), the island’s largest producers. These entry-level wines come mostly from the flatlands—fertile soil that makes for a plumper style with flavors veering towards tropical fruit (think pineapple and citrus). Both are easy summer quaffers that’ll brighten up any grilled fish like a spritz of lemon. You also might bump into two excellent examples from Bolgheri, Tuscany’s Gold Coast, both by boldface names: Antinori, vintners for 500 years, crafts an elegant, full-bodied Vermentino di Bolgheri ($20) at their GUADO AL TASSO estate. Down the road is POGGIO AL TESORO, a new property of the Veneto-based Allegrini family, known for their Amarone. Using a small-berried clone from Corsica, they make Solosole Vermentino Bolgheri ($18), redolent of acacia and fresh apricot. Like the best Vermentinos, this has prolonged lees contact and no aging in wood (thus its name solo sole, or “only sun”), resulting in clean, concentrated flavors. The jewel in the crown is the rare Vermentino di Gallura, the only Vermentino to warrant top DOCG classification. Gallura is an area on the jagged northern edge of Sardinia, where vineyards grow on granite cliffs with just the barest hint of top soil. Buffeted by winds from the open sea, the stressed vines produce Vermentino is at its most intense. Though Sella & Mosca makes a gorgeous Gallura, production is just too small for export. Sadly, that’s a common tale. Scouring New York’s meticulously stocked, sommelier-worthy wine shops, I could find just one: Vermentino di Gallura Juannisolou from VIGNE SURRAU ($16). So if you see a Vermentino di Gallura, grab it. But take heart. The crème de la crème, in my opinion, comes from Liguria. Maybe I’m biased, living part-time near Gavi, which was once part of Liguria. Or maybe it’s because their Vermentino is so finely chiseled. It’s leaner, bracingly clean, and offers that benchmark bouquet of wild herbs, broom, and minerality that I adore. So do yourself a favor. Hunt down a good Vermentino and some fresh focaccia. Pour yourself a glass. Then pour another alongside your pesto alla genovese. Then another with your roasted sea bass with olives, cherry tomatoes, and rosemary potatoes. You’ll swear you can hear the waves breaking. This article was first published in UNCORKED (April 10, 2012).